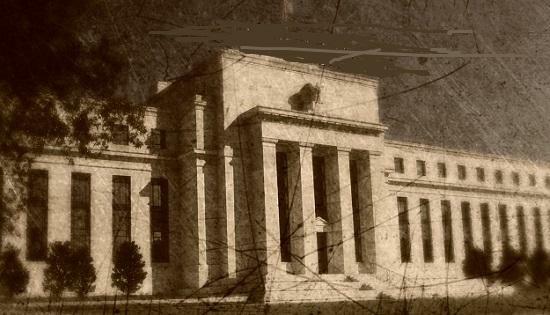 Is The Federal Reserve 'Public Enemy Number One'? The US dollar was backed by gold as recently as 1971. Any central bank in the world could present the Federal Reserve $35 and receive 1-ounce of gold in exchange. However, on August 15, 1971 – blaming it on the “gnomes of Zurich” – President Nixon “temporarily” broke the dollar’s last link with gold. Nixon closed the “gold window” and reneged on the promise to exchange an ounce of gold for $35. Since then, the system of credit in the US has been under the Fed’s complete control. Unsurprisingly, without the natural braking action provided by gold, the value of the dollar has collapsed and the ensuing 45 years are the most crisis-ridden period in American economic history. The case against today’s Fed can be made in a number of ways. A method – which enjoys the advantage of hoisting Ben Bernanke on his own mathematical petard – is to use economic statistics from two eras – 1967 and 2015. One of the reasons Ben Bernanke is such a big fan of baseball is his fondness of statistics. In baseball, like few other sports, players from one era can be compared to players from other eras because the game has changed so little. Because of his fondness for baseball statistics and their constancy over time, Bernanke should be sympathetic to the data presented here – even if it exposes the enormous damage he and the Fed have visited on hundreds of millions of hard-working Americans. The chart below speaks volumes about the disastrous impact of Fed policies since 1971. The chart also reveals how the credit inflation the Fed has created, actually masks the disastrous impact of the Fed’s policies. Specifically, the Fed-induced inflation makes it difficult for the average worker to realize that even though their salaries have soared in dollar terms, these salaries now purchase much less than they used to. 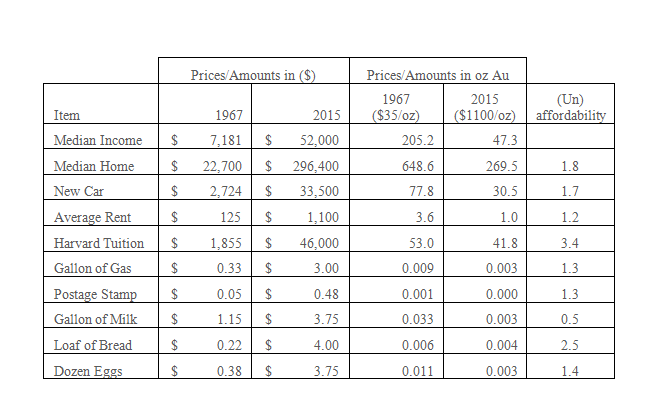 The chart lists prices for several common items as well as average incomes and home prices for the years 1967 and 2015. In addition to defining prices and incomes in dollars, prices and incomes are also defined in their equivalent amounts measured in ounces of gold. The equivalent “ounces of gold” are simply determined by taking the price in dollars and dividing it by the prevailing price of gold for the time period under review. As a result of the collapsing value of the dollar – it is worth less than 3% of its 1971 equivalent in gold terms – it is not completely straightforward to compare economic performance in 1967 with the performance today. When prices and incomes are measured in dollars they appear to be soaring – annual incomes have risen from $7,181 per year to $52,000. However, when these same incomes are measured in ounces of gold, they appear to be collapsing – falling from 648.6-ounces per year to just 269.5. Because money – whether it manifests itself as paper currency issued by a central bank or a constitutionally prescribed amount of precious metal – is merely a store of wealth and a means of exchange, the Fed’s incompetence is best demonstrated by comparing what the average person can purchase with his salary today versus 1967. The last column in the chart measures how much more unaffordable everyday items have become to the average worker, and does so without using dollars or gold. Instead, this column computes the cost of an item on the basis of the median worker’s income for both 2015 and 1967. A ratio of these two costs is then taken with the 2015 cost in the numerator. For example, let’s examine home prices. In 2015, a house cost the average worker 5.7-times their average annual income (296,400/52,000). In contrast, in 1967 the median house cost the average worker just 3.06-times their average annual income (22,700/7,181). Measured against the average worker’s income, today’s house costs 1.8-times more than the 1967 equivalent house (5.7/3.06)! With the exception of a gallon of milk, every item in the chart has become more expensive to the average worker since 1967. In conclusion and as shown here, when prices of goods are measured in terms of incomes, we can clearly see that today’s incomes purchase much less than they used to. The clearly demonstrated fact that the average worker – the backbone of any economy – has been falling behind for decades on end shows the problems with the US economy are deep, systemic and long-running. As evidenced here, these problems clearly have their origin in the Fed’s monetary mismanagement and the failure of the dollar to maintain even a fraction of its value over time.